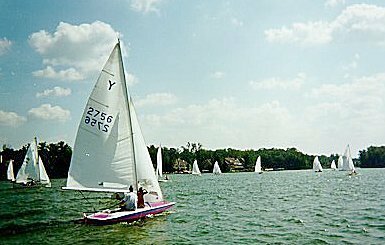 Come join us in one of the most versatile, user-friendly sailboats on Geist. 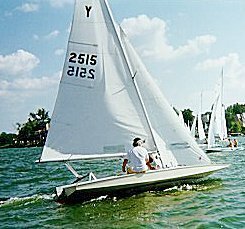 the Y-Flyer's flat hull shape and hard chines provide a stable sailboat that is easy for people of all ages and sizes to sail. The Y-Flyer is extremely fast and responsive due to the planing nature of its hull. The boat is usually raced with two people, but may be sailed single-handed in the lighter air. For just the fun of sailing, in any air, the Y-Flyer has room for several people. Join us for any of our social events and discover the easy-going camaradarie of the Y-Flyer sailors. Children are always welcome and there is a strong family orientation in all of our events. Bring your children on the boat with you. You will discover that, while the Y-Flyer is a competitive racing boat, it is easy to sail. Both adults and children can pull in the sails and enjoy a day on the lake together. So pack your picnic basket and come out to the lake for a day. Whether you are interested in competitive racing or a relaxing afternoon of day-sailing, you will enjoy the friendly sailing banter on shore. Perhaps you will luck upon one of our infamous heaving hors d'oeuvre parties at the end of the day. Whether you are new or experienced at sailing there is always a Y-Flyer sailor willing to help you with tips on anything from sailing tactics to boat building. Fleet 8 sailors have won the International Regatta, Mid America Cup (MAC) regattas, and local regattas, and they are eager to share their knowledge with all our members. If you are interested in traveling, many of our sailors travel and compete in the International and National regattas as well as the MAC regatta circuit, which holds a regatta about once a month during the summer racing season. For more information, visit the Y-Flyer website. So escape from the focus of work and the day-to-day routine. Experience outdoor recreation with a new focus. Buy a Y-Flyer and enjoy making new friends while learning new sailing skills. ISC can be your own personal state park. Take advantage of it! Come sail with us and experience flying a Y-Flyer.